August in Edinburgh. 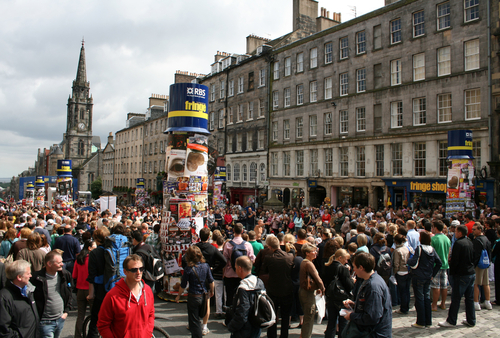 The city is taken over by the festival, and the streets thrum with people handing out flyers, juggling, singing, rushing to watch shows, rushing to perform shows, milling around, and generally festivaling all over the place. In these early weeks, it is so interesting to watch the visitors to the city start to own the place. The manner in which people move around the streets alters. Initially there is an excited energy, a spirit of adventure, curiosity, and discovery. And then gradually, the energy changes from curiosity to familiarity, and the performers, ushers, bar staff, and festival visitors start to become a happy kind of exhausted which leaves them more relaxed and at ease here. Ultimately, I see people lounging around, arms draped over the shoulders of someone they may barely have known three weeks ago. It is the immersion in a creative experience that does it, I think, and it creates powerful bonds between people and location. I know the feeling they are experiencing and I also know that from the outside, residents of Edinburgh can read the attitude as a kind of arrogance which can be a little bit off putting. But it is a wonderful thing for people to experience and this post is my welcome to you all. Enjoy owning our city! Make for yourselves great memories, establish friendships, create in-jokes and nicknames, and always remember Edinburgh with fondness. It is a beautiful city, and big enough to share. My heart is full; my mind is empty!